CITATION Noël Smith, B. L., Becker, K. L., Miller, L. R., Reid, N. S., Sorenson, M. D. (Eds.) (2014). Collective Unravelings of the Hegemonic Web. Charlotte, NC: Information Age Publishing. Collective Unravelings of the Hegemonic Web represents the culmination of work that emerged from 2013 Curriculum & Pedagogy annual conference. 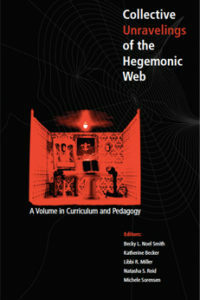 The notion of the hegemonic web is the defining theme of the volume. In this collection, authors struggle to unravel and take apart pieces of the complex web that are so deeply embedded into normative ways of thinking, being and making meaning. They also grapple with understanding the role that hegemony plays and the influence that it has on identity, curriculum, teaching and learning. Finally, scholars included in this volume describe their efforts to engage and undergo counter-hegemonic movements by sharing their stories and struggles. CITATION Espinosa-Dulanto, M., Humpal, D. L., Pitre, L., Smolen Santana, J. (Eds.) (2013). 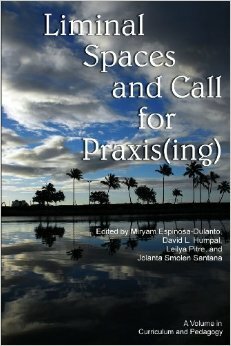 Liminal Spaces and Call for Praxis(ing). Charlottesville, NC: Information Age Publishing. SUBJECTS Curriculum Studies, Critical Theory, Curriculum Theory, Pedagogy, Social Justice, Theory & Practice. Liminal Spaces and Call for Praxis(ing) follows the theme of the Curriculum & Pedagogy conference that highlighted issues of power, privilege, and supremacy across timelines and borders. This volume comprises of an interconnected mosaic of theoretical research and praxis. Facing the current and future challenges of corporatization of education, it becomes imperative to identify and deconstruct elements that provide more responsive and fertile ground for a research and praxis based mosaic of pedagogy. This volume includes works of those scholars who identified or worked with communities of color and/or who drew on the activist and intellectual traditions of peoples of color, third world feminism, indigenous liberation/sovereignty, civil rights, and anticolonial movements. CITATION Sams, B., Job, J., & Jupp, J. C. (Eds.). (2012). Excursions and recursions through power, privilege, and praxis. Charlottesville, NC: Information Age Publishing. 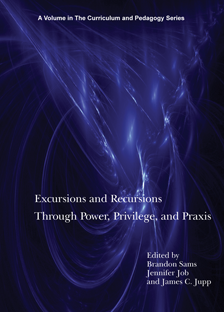 Excursion and Recursions Through Power, Privilege, and Praxis gathers creative scholarship and conference reflections dwelling with/in the difficult and promising spaces of getting lost in curriculum theory. The book gravitates toward two intertwining themes, both of which provide contemporary echoes of the re-conceptualist method, currere: excursions (getting lost, running out) and recursions (returning home, running again). The authors, invited to write from a place of being lost or wandering, express themselves through risk, anxiety, and tension manifested by the themes in the curriculum field and in sites of curriculum. They offer readers and opportunity to challenge “entrenched” beliefs about education, social justice, and what it means to theorize about and/or practice curriculum and pedagogy. CITATION Reilly, C., Russell, V. Chehayl, L. K., & McDemott , M. (Eds.). (2011). 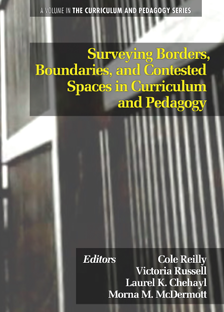 Surveying borders, boundaries, and contested spaces in curriculum and pedagogy. Charlottesville, NC: Information Age Publishing. Born of the energies, enthusiasm, insight, and evolving work featured at the 11th Annual Curriculum & Pedagogy (C&P) Conference in Akron, Surveying Borders, Boundaries, and Contested Spaces in Curriculum and Pedagogy serves to foreground some of the more marginalized narratives within the interwoven spaces of curriculum and pedagogy. 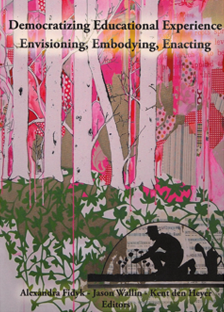 In that very spirit, the book shines a light upon scholarship that acknowledges, troubles, and/or expands the work being done around existing borderlands of curriculum and pedagogy—blurring the dichotomous architectures of public and private, theory and practice, cultural capital and the absence thereof, etc. Whether dividing lines were being illustrated, celebrated, or blurred, disrupted or deconstructed, transcended, troubled, or something else entirely, the result is a powerful collection of strong work(s) shedding light upon systemic boundaries, borderlands, and frameworks for understanding that often go misunderstood. Indirectly related pieces are brought into conversation with one another thematically, throughout four emergent themes: 1) theory + practice, 2) inside(r) + outside)r(, 3) silence + noise, and 4) capital + deficit—each relating to a different archetypal binary or conceptual blockade that those pieces blended, blurred, blared, and/or blighted. The serendipitous fitting of the four thematic sections offer prominent parallels to some of the noteworthy tensions observed in the C&P Group (as well as throughout the fields of curriculum and pedagogy as a whole). Contributors include Marie Battiste, Christian Belden, Blanca Caldas Chumbes, Melissa Castañeda, Antonino Giambrone, David L. Humpal, Erin M. Humphries, Jaime Lopez, Melina Martinez, Myosha McAfee, Michael T. Ndemanu, Elva Reza-López, Amy Shema, and Nicole V. Williams. CITATION Maudlin, J., Stodghill, B., & He, Ming Fang. (Eds). (2010). Engaging the possibilities & complexities of hope: Utterances of curriculum and pedagogy’s past, present, and future. Troy, NY: Educator’s International Press Inc. Engaging the Possibilities and Complexities of Hope: Utterances of Curriculum and Pedagogy’s Past, Present, and Future features papers and narrative utterances that emerged from the 10th Annual Curriculum and Pedagogy Conference held in Decatur, Georgia, October 7th-10th, 2009. 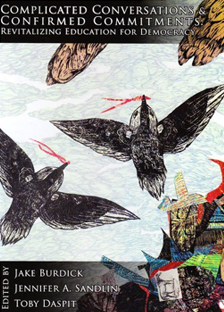 This volume assembles invigorating senior and emergent curriculum workers/scholars/activists to reflect on the past, improvise the present, and imagine the future of the inquiry landscape the Curriculum & Pedagogy Group has created in the past decade. This volume advances the field of curriculum and pedagogy by illuminating historical trajectories, honoring its practical, contextual, and theoretical diversities, contradictions, and complexities, and projecting curricular and pedagogical possibilities. It calls for curriculum workers, activists, and public intellectuals to transgress cultural, socio-political, linguistic, national, geographical, and disciplinary boundaries (He & Phillion, 2009) to transform theory and practice. EDITORS Jake Burdick, Jennifer A. Sandlin, & Toby Daspit. CITATION Burdick, J.. Sandlin, J. A., & Daspit, T. (Eds). (2009). Complicated conversations and confirmed commitments: Revitalising education for democracy. Troy, NY: Educator’s International Press Inc. Arranged as a post-structural catechism, Complicated Conversations and Confirmed Commitments: Revitalizing Education for Democracy engages readers in dialogue around curricular and pedagogical problems via a series of posed queries and responses in the form of writing and imagery from emerging and experienced educational practitioners, artists, and curriculum scholars. Rather than seeking fixed truths, however, the authors in this collection instead offer problematic, poetic, and consciously irresolute responses to contemporary educational issues, responses that respect the need for a fluid conceptualization and enactment of democracy in pluralistic, complex cultural spaces. Collectively, these authors describe the im/possibilities inherent in attempting to reconceptualize curriculum and pedagogy towards more just and humane ends. CITATION Fidyk, A., Wallin, J., & den Heyer, K (Eds). (2008). Democratizing educational experience: Envisioning, embodying, enacting. Troy, NY: Educator’s International Press Inc.
Democratizing Educational Experience: Envisioning, Embodying, Enacting assembles the work of both emergent and key curriculum scholars (Madeleine Grumet, David Jardine), educational theorists (Doug Aoki, Peter Taubman), and visual artists in an effort to inquire into the specific contestations, presumptions, and issues surrounding both the present and future of democratic education. The diversity of scholarly works and artistic contributions that appear in this timely collection demonstrate that the task of educating for a democratic society continues to be complicated and unsettled. It is in this vein that Democratizing Educational Experience intensifies many of the key challenges facing pedagogy today, opening new lines of questioning and opportunities for inquiry. Less a collection of stand-alone essays and artworks than a pluralist dialogue on democracy, the format of Democratizing Educational Experience is unique in its organization. Specifically, the visual art that appears in the collection is not simply aesthetic, but rather, conceived as a non-textual response to the collected essays. Democratizing Educational Experience hence begins to build bridges with other disciplinary modes of expression as a means to engage with a diversity of conceptual and imaginary resources for thinking about democracy today. CITATION Leafgren, S., Schultz, B. D., O’Malley, M. P., Johnson, L., Brady, J., & Dentith, A. (Eds.). (2007). 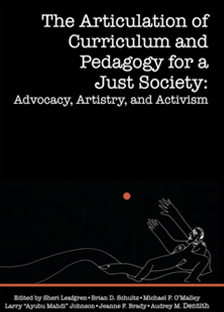 The articulation of curriculum and pedagogy for a just society: Advocacy, artistry, and activism. Troy, NY: Educator’s International Press Inc. This insightful edited collection draws attention to multiple, different, and worthwhile ways in which the articulation of curriculum and pedagogy can promote a just society. 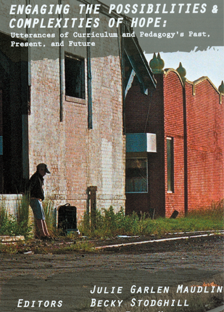 Each chapter in the volume provides ways of thinking about the urgency at hand by providing sites, situations, and possibilities for disrupting colonizing scripts. Through their writing, the scholars, teachers, artists, and activists invoke diverse ways of thinking about, challenging, reflecting, and doing the curriculum work associated with justice through artistry, advocacy, and activism. These powerful essays serve as models, challenges, provocations, furthering conversations that embrace the urgencia of the present historical, political moment, and which support a new awakening. 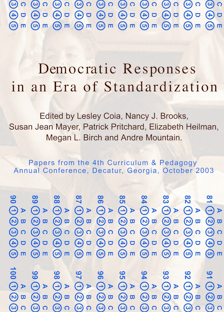 (Contributors include: Phyllis Burstein, Elizabeth S. Foster, Debra Freedman, Barbara Graham, Mei Wu Hoyt, M. Francyne Huckaby, Barbara Hollingshead, Lucy E. Larrison Sheri Leafgren, Jennifer Milam, Michael P. O’Malley, Maya A. Roth, Jennifer Sandlin, William H. Schubert, Brian D. Schultz, Stephanie Springgay, Peter Taubman, and Tommy Trantino). CITATION Coia, L., Brooks, N. J., Mayer, S. J., Pritchard, P., Heilman, E., Birch, M. L., Mountain, A. (Eds.). (2003). Democratic responses in an era of sandardization. Troy, NY: Educator’s International Press. SUBJECTS Collaborative writing, Arts-based inquiry, public pedagogy, standardization, critical theorizing. Here are the papers from the 4th conference on Curriculum and Pedagogy. The papers from this volume and the preceding conferences contribute to the curriculum field in an important way. Curriculum and teaching are treated as an integral whole . . . and (it) advances a personally challenging and professionally demanding standard that encompasses a wide range of topics. The articles in these volumes present pieces reflective of the on-going focuses: writing collaboratively, inquiring through the arts and expressing innovative means of initiating social action on matters of grave educational and cultural concern. In addition, it continues to further the belief that it is imperative that educators deepen their critical insights into the historical, political, personal, aesthetic, spiritual and institutional subtexts and contexts of curriculum that impact daily educational practices.